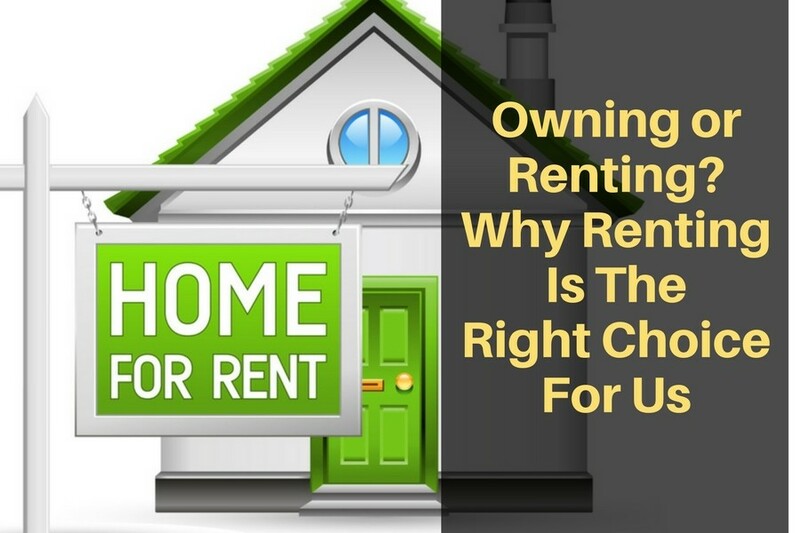 Before I talk about real estate and why renting is the right choice for us thanks to all of the advantages we experience, let’s cover some background information for comparison sake. We are a fortysomething couple who met 10 years ago. Prior to meeting each of us had experienced the joys of renting and owning. We have both shared apartments with roommates, as well as rented on our own. We each owned our own home when we first started dating. We decided to move in together 7 months after we first started dating. I sold my home and moved into the home my husband had just purchased. Several months later we visited some show homes and fell for one model home in particular. The design inside the home felt like you were walking into a Ski Chalet nestled in the mountains. At the time we both had full-time jobs and a nice savings account. To me, my husband’s home felt small and crowded so we decided to have this model home built to our specs. We thought we were buying from a good builder as they were well known in the city. We visited the house everyday as it was being built and soon noticed a number of defects. It only took the builder six months to build the house and over that time we became quite stressed out with over a 100 poor construction issues to deal with. They addressed some of the issues but never fully addressed all of them, even after we moved in. We loved the design of our home and the fixtures that we chose but we still needed things. We needed to landscape both the front and back of the house and we needed to build a fence. That is how we spent our first summer there and a big junk of money. After several winters we noticed that our heating bills were very high. We could actually feel a draft through some of the outside walls. Our master bedroom was built at the front of our house over top of the garage. It was too cold in the winter and we suspected that they didn’t insulate enough. In the 4 years that we were there more and more issues showed up. We would have needed to tear down drywall to repair some of them and neither of us wanted to spend any more time or money on the house. At the same time our spending habits in general were out of control. After 4 years of living in our brand new house, we listed it with a Realtor and sold it within 11 days. If our overall financial situation had been better at the time we probably would have purchased a new house, because we did sell our home for a very nice profit. But I am so happy that we chose not to buy another house, because renting has been so much nicer and easier for us. We took the money that we made from selling the house and put it in the bank. And, from the minute we moved out of that house we began saving $750 a month. We are now in a house that is the same size as the one we owned but is 17 years old instead of brand new. And you know what? It is nice and warm. We are in a nice quiet neighbourhood, in a good location, and even if we had enough money to buy another house right now, we wouldn’t. The housing market is and has been quite volatile and it has always been very difficult to predict whether the price of homes will rise or fall. Also, many people purchased homes back in 2006 when housing prices were extremely high in Canada, and now they are finding it difficult to sell because prices have dropped so much since then. Renting a house or an apartment has lots of advantages. One of the greatest advantages to renting is that your maintenance costs are typically very low. Yes you will still need to look after things like replacing a burnt out light bulb, keeping the furnace and air conditioner filters clean and repairing any minor damage you may make such as dents in a wall, etc. However, your landlord will be responsible for paying for any major issues such as leaky pipes, major appliances or a furnace that stops working in the middle of the coldest winter in history. Should you buy a house and then decide in a couple of years that you want to move you will incur high REALTOR fees which will most likely eat up any equity you may have accumulated in the few years you were there. If you rent a house or apartment you will probably sign a 6 month or 1 year lease. This offers you a great deal of flexibility should you decide that you want to relocate at the end of the lease. And if not, you simply renew your lease, based on availability. Renting is a great option because you don’t have to qualify for a huge loan such as a mortgage to rent a house or an apartment, and you do not need a large down payment either. In most cases (not all) you just need first and last month’s rent. 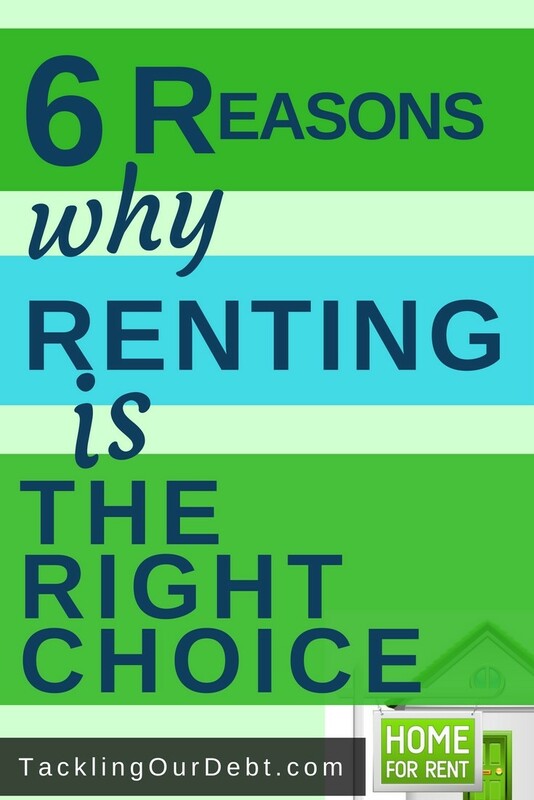 One of the biggest reasons why renting is the right choice for us is because we are able to save so much money. It is easier to keep yourself on a budget because renting a house or an apartment means that you do not have to pay property taxes, mortgage insurance or interest on a mortgage. And, better yet, you do not have to worry about surprise emergency repair costs, like a leaky roof, crack in the foundation, or broken appliances. You pay a fixed monthly rent, low renters insurance and your utilities (if they are not covered by your rent payment). Your additional income can go towards your savings and retirement, debt repayment and the fun things you want to do today. If you are renting an apartment in an apartment complex it usually includes many amenities such as access to a fitness centre, pools, and lounges for socializing. Yes there was a time when home ownership was a wise investment because property prices were either stable or consistently on the rise, and people felt they were safely building equity on their investment. That sense of security changed drastically in 2007 to 2009 when homeowners all over the place experienced serious price drops on their homes. Everyone’s situation is different, but during those years many people were forced into foreclosure because the value of their mortgage was higher than the appraised value of their house. In recent years people from all walks of life are making the decision to rent a house or rent an apartment instead of buying. Plus, when you rent a house you can take all the money you would have spent on buying and maintaining a house and invest it elsewhere.